Goasia is a versatile and widely appreciated Serbo-Croatian duo who spreads powerful vibes all around the world. Amphibians On Spacedock is the sequel to the highly acclaimed Dancing With The Blue Spirit (Kagdila) and From Other Spaces (Suntrip). With its inimitable style mixing powerful banging sequences with subtly melodic breaks and flawless production, Goasia will send you to space once again! The album starts with God, Good Morning a superb composition with a shamanic intro and explosive melodies all over the place. Amphibians On Spacedock is another morning tune with bouncing acidic sequences, immediately followed by The New Orient, a crazy uplifting killer full of eastern melodies. Mental Mutator is a mysterious track that gives you a little time to breathe before Dolphins Of Jupiter kicks in and radiates through your body with its avalanche of melodies! Promised Land follows up on the same note, achieving a fantastic mix of energetic and morning layers! Still standing? OK, Sundance and Orbital Saturation are there to drain your last forces, the former being more mysterious, while the later revisits the eastern style in a twirling and insanely trippy way!!! Lastly, Tetrodotoxin closes the album with a darker mental banging style. 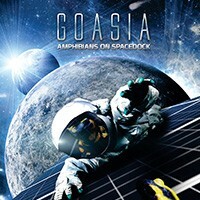 With this new album, Goasia has reached a new level, and we hope you’ll enjoy it, hoping like an amphibian on the spacedock of your fantasies! Like usual this album is crystal-clear mastered by Tim Schuldt!